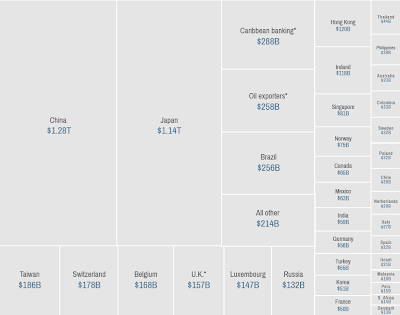 This Great Graphic shows the international holders of US Treasuries as of July. The graph was posted on CNNMoney. 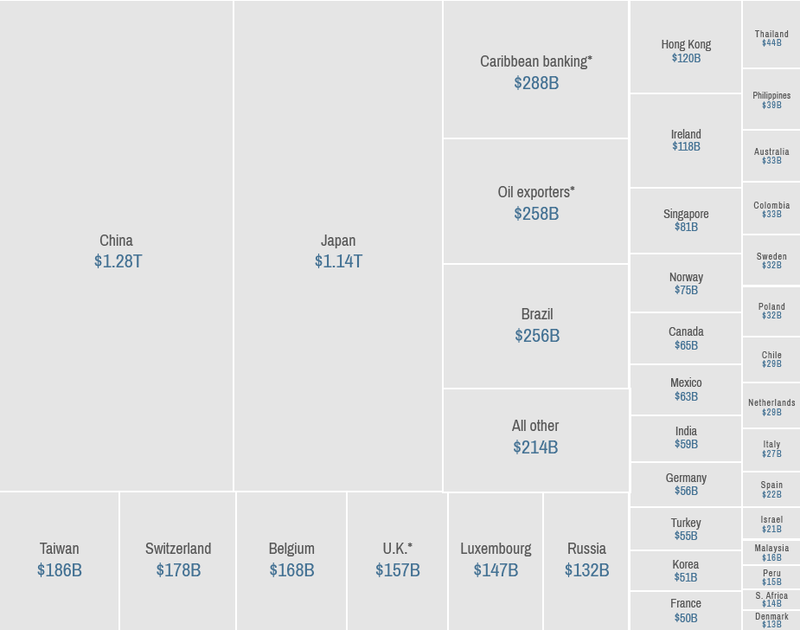 Of the roughly $5.6 trillion worth of Treasuries held abroad, $2.42 trillion, or about 43% is accounted for by two countries, China and Japan. If anything, China's figures may be under-estimated. Often the data is revised that reallocates purchases from financial centers, such as Luxembourg or the UK to China. Most of the Treasuries held by foreign investors function as reserves. Moreover, a little more than half (52%) of foreign holdings of Treasuries in July were held at the Federal Reserve in its custody account. Foreign investors have financial claims on the US government. The bonds represent borrowings. The government borrows the funds to pay its bills, which are primarily private enterprise, supplying services or goods. In recent discussions of default, most observers are focused on maturities and coupon payments due around the the time the debt ceiling is expected to be reached. The delay of payments to private sector creditors for goods provided or services rendered is rarely thought of in the same context. Miss a coupon payment and a pox upon your house. Delay a payment to a private contractor or postpone a paycheck and that is some how better. Not paying such creditors is a notable problem in Europe. Small and medium size often do not have the same access to credit as larger businesses. They provide many government services, in some countries, like Italy and Greece. Delay in payments by governments has exacerbated the financial squeeze. Italy earlier this year agreed to borrow more funds to make such private sector arrears. There is some speculation that the dysfunction of the US political system, and the threat of default, may hasten the diversification of reserves away from the dollar. While is is a possible outcome, we remain skeptical. There is simply not a viable alternative that is as deep and liquid as the US Treasury market. No other market can absorb the massive flows, mostly generated from either current account surpluses or efforts to prevent currency appreciation.